Preheat oven to 350. Lightly grease 2 to 2.5 quart baking dish. In a large bowl, mix the soup, sour cream, 4 Tbsp. butter, dried onion flakes, and pepper. Stir in the hash browns and half of the cheese. Pour into the baking dish. 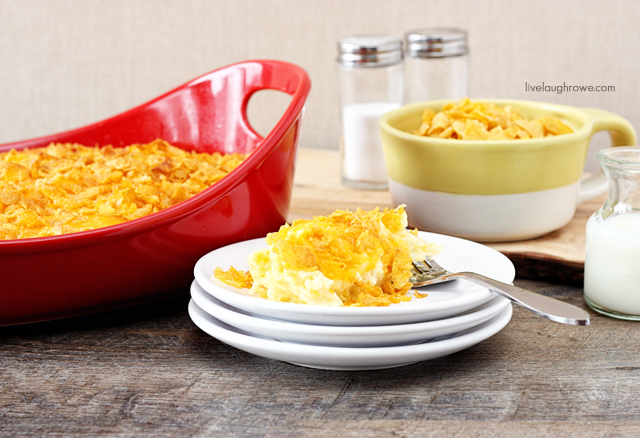 Sprinkle with remaining cheese and top with crushed cornflakes. Pour remaining butter (melted) over the casserole. Bake 45 minutes or until cheese is melted and bubbly.